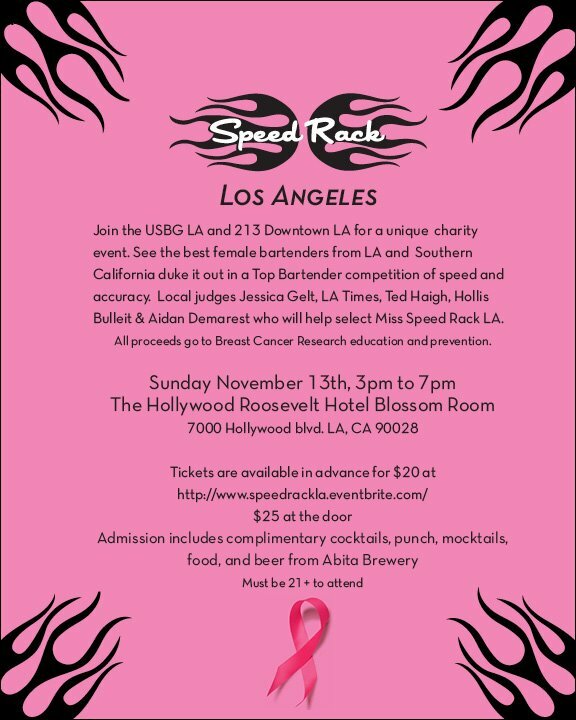 The all-female, national bartending competition known as Speed Rack is taking over the Blossom Room at the Hollywood Roosevelt Hotel on Sunday, November 13th. Speed Rack was conceived by Ivy Mix and Lynnette Marrero of the New York chapter of LUPEC (Ladies United for the Preservation of Endangered Cocktails). 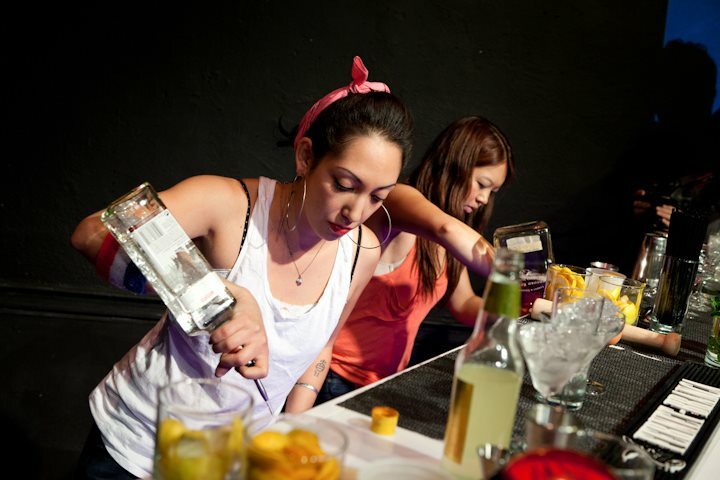 Speed Rack is the only national cocktail competition that features top female bartenders in key cocktail markets battling head-to-head in timed challenges. The fast-paced competition is the first of its kind to highlight the up-and-coming generation of women in the industry. Speed Rack launched a ten-city tour in October to honor National Breast Cancer Awareness Month, with the purpose of finding the fastest female bartender in America while raising funds for breast cancer charities. The Speed Rack tour follows the success of the inaugural LUPEC NYC Speed Rack competition, which raised $3,500 this past June. The national tour kicked off last month in Boston, where Sabrina Kershaw (The Citizen, Noir Bar) was crowned the winner and $5,000 was raised. Next was Portland, with $3,600 raised and Seattle’s Missy Cross (Sun Liquor) emerging victorious. Throughout the afternoon, pairs of bartenders will face off and make a round of cocktails, selected from a list of 50 industry standard recipes. Judges will rate each drink based on prep time and accuracy. The esteemed judging panel includes Hollis Bulleit of Bulleit Bourbon, Aidan Demarest (Neat), Jessica Gelt (LA Times), and Ted Haigh (aka Dr. Cocktail). Emcee Simon Ford will keep the proceedings moving as the competition nears its climactic final showdown. Following the LA competition, Speed Rack will travel to other cocktail-focused cities with strong LUPEC chapters, including Washington DC (Dec 4, 2011) and then on to San Francisco, Houston, Denver, Las Vegas, and Chicago in 2012. The goal for the nationwide competitions is to collectively raise $75,000 before the ultimate Miss Speed Rack is crowned in May 2012 at the national finals in NYC. The tour is being produced by Lindsey Johnson of Lush Life Productions, with event coordination by Claire Bertin-Lang (Proof ABV). Local support for Speed Rack LA is being provided by 213 Nightlife and the USBGLA. Presale tickets to Speed Rack LA are $20 and are available online at speedrackla.eventbrite.com. A special admission and Speed Rack t-shirt package (with bonus free koozie) is priced at $35. Tickets at the door are $25, cash only, based on availability, and are first come, first served. For more information, visit the Speed Rack website at www.speed-rack.com. $20 General Admission and $35 Speed Rack package tickets: speedrackla.eventbrite.com. Day of event: $25 at the door, cash only and based on availability. Includes complimentary punches, cocktails, Abita beer, and food. Proceeds go towards breast cancer research, education and prevention.